HUB: 2 Satellite Hub, 3 sets of amplified autogain outputs. 2 at -29dBm, 4 at -34dBm, includes power supply. Two satellite hubs are illustrated for use with DISH 110ÃƒÃ‚Âº and 119ÃƒÃ‚Âº signals. This is the most common application. They can be used to split 250 to 2150 MHz DBS inputs to multiple outputs. 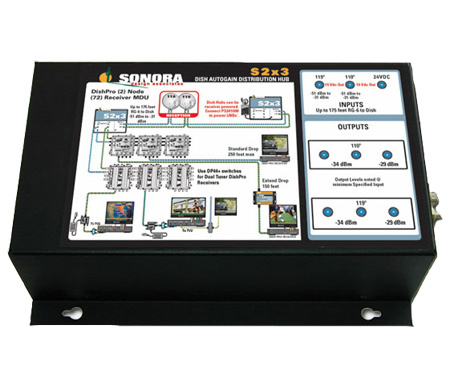 Multiple satellite hubs are available for one, three and five coax inputs (models S1x6, S1x8, S1x12, S1x16, S1x24, S1x32, S3x3, S3x6, S3x8 -amp; S5x8).